During the set-up process, we recommend wearing gloves to avoid finger marks on the stainless steel which will need to be cleaned off. The mirror finish of the stainless steel needs to be treated with care - it should only come in contact with soft surfaces. Use a plastic bag or a newspaper to ensure it does not get accidentally marked from contact with a hard surface. Peel back the protective covering from the foot of the gnomon. Insert the tenon into the slot in the baseplate, so that the gnomon slants towards the midday circle mark. This tenon is (deliberately) a very tight fit, and you may need to rock it back and forth in the slot to ease it in. You only need to get it part way in, so that the retaining bolts can reach it. Turn the sundial over so that it rests (softly) on the end of the gnomon. Insert the two bolts in the threaded holes in the tenon of the gnomon. Turn the bolts until they are hand-tight. If the gnomon is not completely in its slot, rock the gnomon back and forth until it is possible to tighten the bolts a bit more. Repeat this process until the tenon is fully pulled into the slot, as shown in the picture below. 1. Place the sundial on any horizontal surface. 2. Set your watch accurately by a radio time signal. 3. Find out the time of solar noon at your location using our unique Solar Noon Calculator. 4. 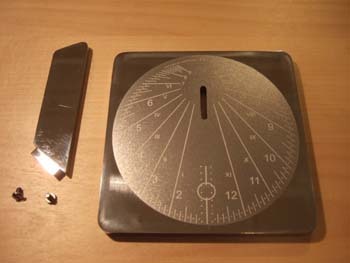 When your watch reaches the exact time of Solar Noon, rotate the sundial until the shaft of sunlight shining through the slit in the gnomon lies exactly along the dotted noon line. 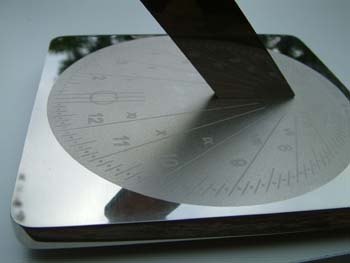 Your sundial is now set accurately to true North. You can mark the position of the feet if you want to be able to put it back into position if it is moved out of alignment. 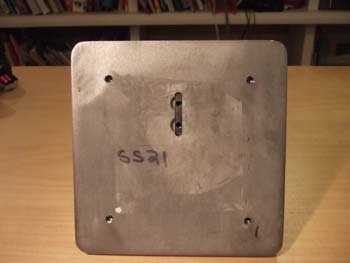 If you want to fix the sundial permanently to a plinth or any other horizontal surface, the easiest method of attaching it is with a modern contact adhesive such as No-Nails. With this method, if you ever want to reposition it later on, it is possible with some difficulty to prise the sundial off again. For a more permanent fixing, you can insert M6 bolts into the blind holes on the underside of the sundial, drill oversize holes in the plinth, half fill the holes with resin, and then place the sundial on the plinth. 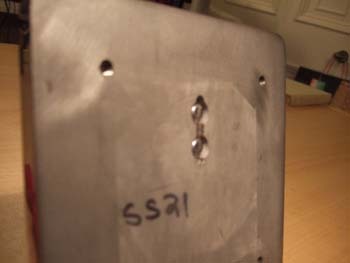 The resin will rise up around the bolts and provide a permanent fixing. Your sundial will require very little maintenance. If you need to clean it, do NOT use any form of commercially available polish, even silver polish - they will all put scratch marks on the surface. We recommend using only a soft cloth and hot water. For any stubborn marks, lighter fluid can be used.